from what % was +4%? Thanks for your love and passion! Although the review campaign has ended, you can still participate in our next campaign. I would glad to see you again. Solar panel is 10W output so in one hour is 10Wh. 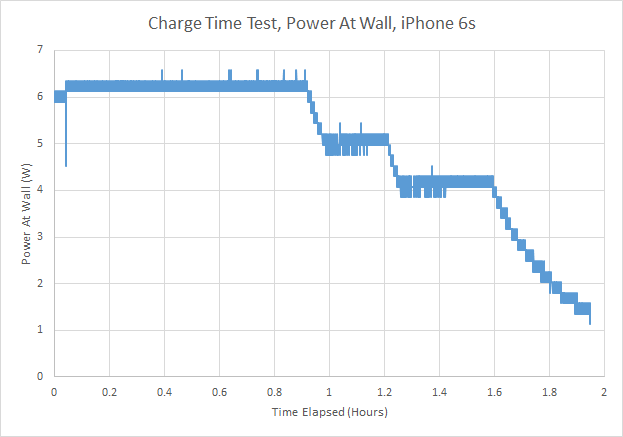 The iPhone 6S It has a 6.91 Wh battery, the pre-trickle 80% period is so 5.5Wh for 80%. so you'd expect 0%-80% in 5.5/10 = 0.55hr or 33mins, or 1% in 33m/80=0.41m or 25s , so at 10W output (max possible from that panel) a full recharge should afford 1% every 25s. You got 4% in 5m, so 1% in 1.25s so you were observing 3x slower than theoretical. Observe it draws 6W, and only as much for half the time, so the pre-trickle phase ends at 0.9 hours not 0.55hr. the act of using a phone slows its recharge, if you had turned it off, it might have charged faster. 5 mins is also a short time, the phone still warm. Note: from any % to 100% is utter nonsense to ever measure as trickle charge makes everything move at a crawl, only a % to 80% is of any value to compare. Another way to put this is that the Anker 21W solar panel is "too powerful" for the iPhone, so your review method to fully use all the output of the 21W via the Powercore II 20000, is one approach. Another approach is to use the 2 USB outputs to charge the iPhone plus another device to not waste sunshine, or (what backpackers seem to favor) use the 14W version to shave a few oz. Anker has become my go-to brand for charging products. Everything from rapid charging outlets to portable batteries to USB cord are durable, well made, and functional. Three years ago, I asked a friend for a recommendation on a portable battery as I had been extremely unsatisfied with ones I had purchased off the shelf and he sent me the amazon link for Anker. Let's just say, I've never looked back. This is my 3rd Anker PowerCore 10000 product, and each one has been better than the last! My family and friends borrow them all the time and they still hold a charge, even that first one from 3 years ago! I purchased the Anker PowerCore II Slim 10000 for the form factor as I have been often finding myself using my phone while charging. This charger is everything as described; both light and thin, it closely mimics the dimensions of my smartphone while the silicon side is soft and grippy - ergonomic is the word that comes to mind. I have been able to get 2+ full charges on my smartphone while in use.My favorite thing is the technology packed into this device. It detects and delivers the fastest charge safely. I have had several rapid chargers in the past that cause my phone to feel like it's overheating, especially if it is in a case, but I have never had this problem since I started using Anker charging products with IQ technology. Again, I often use my phone while charging using the Anker PowerCore II Slim 1000 and both devices (phone and charger) remain at a comfortable temperature.In short, Anker makes great products and the PowerCore II Slim is a fantastic device. Looking forward to purchasing more innovative devices from Anker! Hi @James_Wilton , this campaign has now ended and winners announced. Your welcome to post reviews but it might be best to have the review separate from this thread to allow better feedback direct to your review. Photos and/or video are also a nice touch that can be added. It indeed is a great cable very durable, the only thing i wished is that this cable would become the standard cable for all iOS Devices. My experience with Anker is tremendous and as per my expectations, Anker fulfill everything. That's way I love this brand. Since early 2015 I have made around 15 orders through my friends from USA. Like power bank, Different type of lightning cables, Protection cover, Temper glasses for my iPhone. Simply say, In a single brand a user can get the function of even more than one item. Which is inexpensive, cost effective, Longest lifetime with reliability and user/Customer satisfaction. Can I reveiw or chat in spanish somewhere? Sorry guys, currently our community is still given priority to English communication, but I think we will make a multilingual community in the near future. I know spanish! If I could be of assistance let me knoooow! This is great stuff. Gonna make one soon enough. Love the Anker wires. Won't buy any others. Very durable, and always tangle free. Wish there was a shorter USB-c that I can throw in my edc bags. Got a bunch of micro USB and recently started adding USB-c wires. Can't wait to see more things that I can switch to the USB-c plug in the future like a smaller battery pack or Bluetooth speaker. We have plan to develop a smaller power bank and hope it will coming soon.